Command-line interfaces (CLIs) built in Node.js allow you to automate repetitive tasks while leveraging the vast Node.js ecosystem. And thanks to package managers like npm and yarn, these can be easily distributed and consumed across multiple platforms. In this post we'll look at why you might want to write a CLI, how to use Node.js for it, some useful packages and how you can distribute your new CLI. In fact npx supports executing CLIs even when they are not installed yet. Simply run npx create-flex-plugin and it will download it into a cache if it can't find a locally- or globally-installed version. If you prefer following along a video tutorial, check out this tutorial on our YouTube. Now that we covered why you might want to create a CLI using Node.js, let's start building one. We'll use npm in this tutorial but there are equivalent commands for most things in yarn. Make sure you have Node.js and npm installed on your system. In this tutorial we'll create a CLI that bootstraps new projects to your own preferences by running npm init @your-username/project. There's a few things going on in this small snippet. First we require a module called esm that enables us to use import in the other files. This is not directly related to building CLIs but we will be using ES Modules in this tutorial and the esm package allows us to do so without the need to transpile for Node.js versions without the support. Afterwards we'll require our cli.js file and call the cli function exposed with process.argv which is an array of all the arguments passed to this script from the command line. If you look at the bin key, we are passing in an object with two key/value pairs. Those define the CLI commands that your package manager will install. In our case we'll register the same script for two commands. Once using our own npm scope by using our username and once as the generic create-project command for convenience. 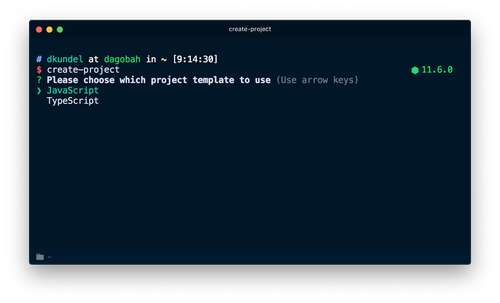 Try running create-project --yes and you should see skipPrompt to turn to true or try passing another argument in like create-project cli and the template property should be set. Try to run the same command with -y and the prompts should be skipped. Instead you'll immediately see the determined options output. Now that we are able to determine the respective options through prompts and command-line arguments, let's write the actual logic that will create our projects. Our CLI will write into an existing directory similar to npm init and it will copy all files from a templates directory in our project. We'll allow the target directory to be also modified via the options in case you want to re-use the same logic inside another project. This code will export a new function called createProject that will first check if the specified template is indeed an available template, by checking the read access (fs.constants.R_OK) using fs.access and then copy the files into the target directory using ncp. Additionally we'll log some colored output saying DONE Project ready when we successfully copied the files. You should see a confirmation that the project has been created and the files should be copied over to the directory. 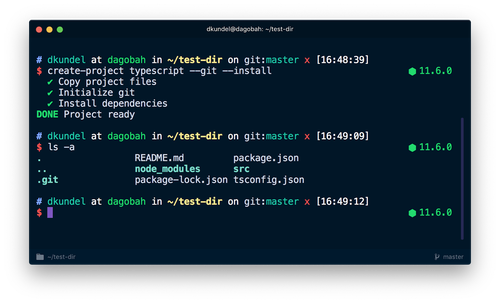 This will run git init whenever --git is passed or the user chooses git in the prompt and it will run npm install or yarn whenever the user passes --install, otherwise it will skip the task with a message informing the user to pass --install if they want automatic install. You should see now both a .git folder in your folder indicating that git has been initialized and a node_modules folder with your dependencies that were specified in the package.json installed. Congratulations you got your first CLI ready to go! Now that you have your CLI code ready there are a few ways you can go from here. If you just want to use this yourself and don't want to share it with the world you can just keep on going along the path of using npm link. In fact try running npm init project and it should trigger your code. If you want to share your templates with the world either push your code to GitHub and consume it from there or even better push it as a scoped package to the npm registry with npm publish. Before you do so, you should make sure to add a files key in your package.json to specify which files should be published. 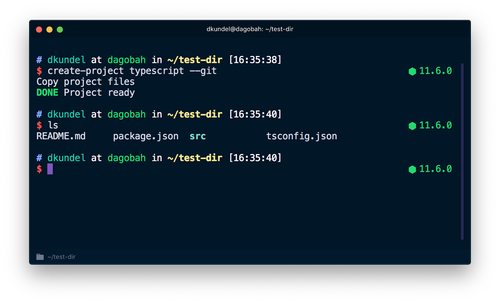 If you want to check which files will be published, run npm pack --dry-run and check the output. Afterwards use npm publish to publish your CLI. 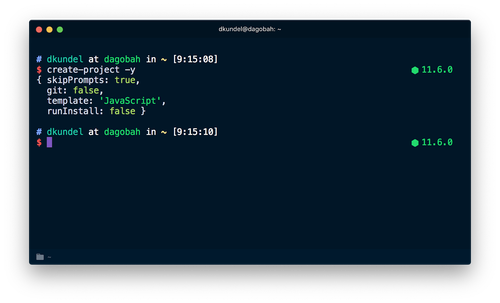 You can find my project under @dkundel/create-project or try run npm init @dkundel/project. There's also lots of functionality that you can add. In my case I added some additional dependencies that will create a LICENSE, CODE_OF_CONDUCT.md and .gitignore file for me. You can find the source code for it on GitHub or check out some of the libraries mentioned above for some additional functionality. If you have a library I didn't list and you believe it should totally be in the list or if you want to show me your own CLI, feel free to send me a message!